Thinking ’bout Quake | Blot Interactive | Imagination at play. With the recent news of John Carmack leaving id Software to focus on working with the Oculus Rift team, it’s a good time to reminisce about the good old days of id. When I think of id, I think Quake 2, the game that for me started the FPS multiplayer phenomenon. 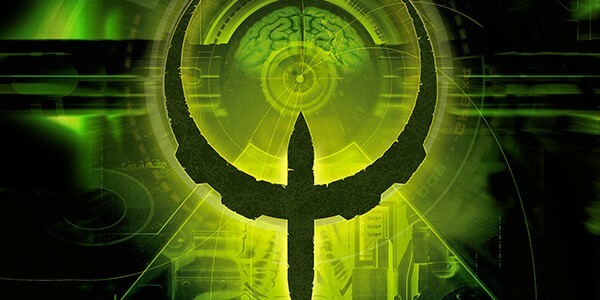 Back in 1997 I was pretty young and wasn’t really into PC games — I was still playing Super Mario World on my new Super Nintendo — but having an older brother meant I was introduced to the fast-paced twitch shooter Quake. Ok, I’m going to put this out there and say at that time I, well, sucked. But could you really blame me? I was 9! But when the AI was put all the way down, I was a god. I spent countless hours blowing up guys with rockets and railguns, having the time of my life. Then, one day my brother came home from school and showed me something that I never thought was possible: mods. Now I had multiple game modes and skins for my character that he and his friends made at school. When I got a bit older, my friends and I would set up LAN parties at school, and we would have nonstop matches for a couple of hours — or until we were kicked out of the computer lab. I can still remember having a match where I was Soundwave from Transformers, facing off against Gene Simmons from Kiss. I wasn’t into Quake’s third installment, Quake 3 Arena, that much, because I had moved onto other first-person shooters like Counterstrike and Unreal Tournament, but the game was still a lot of fun. Even now, I still feel that Quake set the benchmark for first-person shooters, and forced other games in the genre rise above and ultimately become better titles. Now that I’m a bit older, I can fully appreciate how much mods and add-ons meant for the gaming community back then, as it was one of the first times where fans could interact with their favourite games. I also think that Quake helped inspire people to start learning about programming and scripting, and how ultimately they could start making and modding video games themselves. I was still a little too young to get on board with this, but as you can see, it definitely planted the seed that I could become a game developer, and now I’m a programmer in the games industry doing what I’ve always wanted. Have a comment? Leave one below! Also, you can visit our Forums section.